We stayed at the Ovolo as our daughters wedding celebrations were held there. It was a fabulous occasion. Hotel staff couldnâ€™t do enough to help us. Rooms were comfortable, quirky and spacious. Breakfast was excellent and everything about the hotel made it stand apart from other high end hotels, location, architecture, amenities and friendly staff. A great stay.! 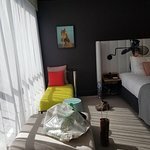 We stayed at Ovolo for my partners birthday. The staff at the hotel were amazing! They organized a number of surprises for our stay. We have stayed in some great places over the years but this place is by far the most comfortable and welcoming! It is also very very clean! The inclusions with the room were amazing! We haven't stopped telling our friends! If you are looking for a perfect stay close to the city then the Ovolo is the place for you. We cannot fault our time at the hotel. The service, accomodation, and amenities are second to none. We left home tense and returned home relaxed. Donâ€™t think weâ€™ll be able to stay anywhere else when we visit Sydney! Check in was smooth and staff were so warm and friendly. When asked reason for our visit I said it was my birthday. Within 30 minutes a bday card and bottle of champagne on ice was delivered to our room. Our room was amazing!! Huge!! Everything we could possibly need was in the room. We had a lovely water view with the young endeavour docked just outside. We partook of the included mini bar, snacks, happy hour and breakfast. All great quality and very much appreciated. Could not get a better location! Such a nice area, in every direction from the hotel. Was so good to be away from the cbd (but within easy walking distance if required). Right on the harbour. Quick, easy, safe and lovely walk to the botanical gardens and Hands Opera near Mrs Macquarieâ€™s Chair. We also walked through the botanical gardens to Circular Quay. .
And the staff - every staff member, in every area of the hotel we enjoyed, were amazing. Could not praise enough. One in particular went out of his way to locate a small screwdriver to fix my spectacles, tho it ended up not small enough. The Ovolo Woolloomooloo is definitely where weâ€™ll stay on our next Sydney visit!! Just make sure to book directly with the hotel to receive the freebies!! Everyone at Ovolo is super friendly and accommodating. You can tell this hotel isnâ€™t owned and operated by one of the big chains, they canâ€™t do enough to make your stay a pleasant one. The rooms are large, stylish and very clean. The bar and restaurant are also fabulous and the whole place has a great vibe plus itâ€™s in a great location. Canâ€™t recommend Ovolo Woolloomoolloo enough!